The ex-wife of Liam McDonnell said jailing the man would not bring Liam back. 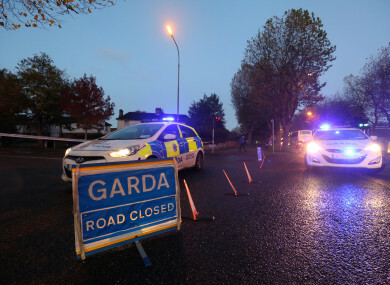 Two gardaí were also injured in the incident. A DRUNKEN DRIVER who killed an elderly pedestrian and injured two gardai – one of them seriously – was today given 240 hours’ community service in lieu of a four-year prison sentence and disqualified from driving for four years. Father of two, Adrian Nestor (44), from Keamsella, Kilcolgan, Galway, pleaded guilty before Galway Circuit Criminal Court last November to causing the death of (66) and causing serious bodily harm to Garda Sharon Casserly, by driving dangerously near Ardrahan in the early hours of Monday, 1 February last year. He pleaded guilty also to driving while drunk and having a blood/alcohol reading of 272 mg per 100mls at the time of the fatal collision. Sentence was adjourned to today for the preparation of reports and victim impact statements. Superintendent Sean Glynn gave evidence that staff at a local nursing home rang gardai at 11.35 pm on Sunday night, 31 March, 2016, to say a resident had left the premises and they were concerned because he was wearing dark clothing. Two garda cars were despatched to look for McDonnell and just over half an hour later, at 12.10 am, Garda Sharon Casserly and Garda Peter Murtagh, who were in one of the patrol cars, located him. He was down on the ground on his hands and knees, on the hard shoulder about 1.5 km on the Galway side of Ardrahan. The patrol car pulled in on the hard shoulder, three to four meters behind McDonnell, facing in the direction of oncoming traffic. Its dipped headlights and blue flashing lights were on. McDonnell appeared intoxicated and he resisted efforts by both gardai to get him into the patrol. Supt. Glynn said that as both gardai were getting him into the patrol car, they were struck without warning by a silver Audi car. The collision, he said, occurred at 12.30 am. The force of the impact caused McDonnell’s death and his body was found in a nearby field. Garda Casserly received severe injuries and her colleague could hear her screaming in agony as she lay further down the road in on the hard shoulder. Garda Murtagh sustained a broken leg, a large cut to his head and damage to his knees and ankles and he could not move to help his colleague. He rang the emergency services from his mobile phone and told Nestor to go to a nearby house for help. Nestor, who sustained a minor head injury in the collision was later arrested and a blood sample showed a reading of 272 mgs. of alcohol per 100 mls of blood. Nestor told gardai he left his home at 7 pm the previous evening to attend a wake near Ardrahan. He had a pint in a pub in Ardrahan before going to the wake a short distance away where he drank a further three to four cans of beer. He left the wake and went to another pub in Ardrahan village where he had another pint. He decided to go home around 12.10 am and was involved in the fatal collision moments later. Supt. Glynn said Mr McDonnell was pronounced dead at the scene. A subsequent toxicology report showed he had 182 mgs of ethanol in his system, which came within the toxic range. A brief victim impact statement from McDonnell’s ex-wife, was read into evidence. “I’m not looking for anything except clemency for his (Nestor’s) young family, as jail will not help bring Liam back,” it read. Impact statements from McDonnell’s two grown-up daughters were also read out. Both said their father had been a talented musician, writer and artist until alcoholism took over his life and rendered him homeless. They thanked COPE and the Simon Community for the excellent care their father had received down through the years and urged people to donate to both services. Supt. Glynn confirmed Nestor had no previous convictions and was married with two children. Judge Rory McCabe asked him to clarify the situation Nestor would have been faced with as he approached the scene of the garda car parked on his side of the road with its dipped lights on. Supt. Glynn confirmed the lights of the patrol car were dipped and the blue flashing lights had been activated. The impact occurred on the inside, left-hand side of the patrol car. The judge said it was very difficult to make an assessment as to how the accident took place because one would not expect the impact to be on that side. Nestor apologised in court to McDonnell’s family and to both injured gardai who were also present. He said he had come around a sweeping bend to find, what he thought was a car full of people travelling towards him on his side of the road. He said he had to make a split second decision to either go left or right and he had decided to go left, which had been the wrong decision. Garda Sharon Casserly, who continues to suffer from injuries she sustained that night, read her own victim impact statement into evidence. She listed out the multiple serious she sustained, including a brain injury, and the court heard she also suffered a stroke while in hospital which left her paralysed on her right side for a time. She had to cancel her wedding day which was due to take place the following June and her career prospects have been put on hold. “My life has been turned upside down because of the mindless and selfish actions of a drunken driver,” she said. Garda Murtagh told the court that while he suffered serious physical injuries he said his one lasting regret was for McDonnell. “I feel like I failed in my duty to protect him,” he said. Nestor told the court he had contemplated taking his own life after that night. He became anxious and depressed and turned to alcohol. He was hospitalised twice for his mental health difficulties and while he no longer drinks, he continues to receive counselling and prescribed medications for depression. He said he was driving around a long, sweeping bend on the way home when he saw a car, which appeared to be on his side of the carriageway. “I was dazzled by the lights and swung to the left to avoid a head-on collision. I didn’t realise it was a garda car. I thought there were people in the car. I didn’t see the two Gardai or Mr McDonnell. “I was faced with a split second decision. Do I go left or do I go right and I made the wrong decision,” he said. “I will forever beat myself up for getting behind the wheel with alcohol taken,” he said. I held her that night in the bushes and I could see how badly injured she was. I can still see how badly injured she was. A probation report handed into court confirmed Nestor suffers from Post Traumatic Stress Disorder, serious depression and anxiety and will need ongoing care. Judge McCabe said the accused had killed Mr McDonnell and had severely injured two gardai. He said they had been out looking for Mr McDonnell and had parked their car on the incorrect side of the road. The accused, he said, had consumed alcohol and had driven into the garda car with serious consequences. The judge said everyone accepted Nestor’s remorse was genuine but the fact he had consumed alcohol before driving was an aggravating factor. He said he had read all of the victim impact statements and the one from McDonnell’s ex-wife was extraordinary in its charity and understanding. Taking Nestor’s previous good record, his genuine remorse, his mental state and the very positive probation report – which deemed him suitable for community service – into account, Judge McCabe said the interests of justice would not be served by imposing an immediate custodial sentence. He said the appropriate sentence was to impose the maximum of 240 hours’ of community service in lieu of a four-year prison sentence for the charge of dangerous driving causing death and serious injury, along with a four-year disqualification. The judge also fined Nestor €1,000 and disqualified him for three years for the drink driving charge. Email “Drunk driver who killed elderly man gets community service after widow pleads for him to avoid jail ”. Feedback on “Drunk driver who killed elderly man gets community service after widow pleads for him to avoid jail ”.